Corporate Creativity consistently connects creative outcomes to the actions that really made a difference to them. Through detailed real-life examples from organizations around the world - including British Airways, Du Pont, Fujitsu, General Motors, Hallmark, Hewlett-Packard, IBM, Japan Railways East, Kodak, Universal Studios, the United States Forest Service, and enterprises in the USSR - the authors show how improvements and breakthroughs actually happen in organizations. Alan G. Robinson and Sam Stern, university professors who have served as advisors on creativity to organizations around the world, believe that the proper combination of imagination and originality is what really pumps life into a company. 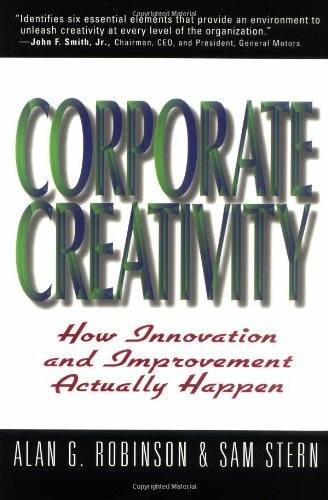 In <i>Corporate Creativity: How Innovation and Improvement Actually Happen</i>, they cite numerous examples of its place in celebrated corporate success stories and suggest various ways that other firms can harness it. Focusing on six elements they see as essential to the process, the authors show how virtually any institution can work to encourage creativity within its ranks. We at Visionarybook sellers describe the books as accurately as possible. We offer a satisfaction guarantee on all of our books. Orders usually ship within 1 business days. Shipping costs are based on books weighing 2.2 LB, or 1 KG. If your book order is heavy or oversized, we may contact you to let you know extra shipping is required.